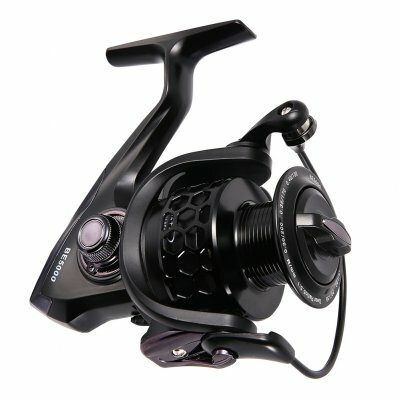 Successfully Added Ultra Smooth 12+1BB Bearing Fishing Reel Honeycomb Design CNC Machined Aluminum Spool 3000 to your Shopping Cart. Flawless light weight graphite spinning reel body with rich black finish is corrosion proof. Amazing aerospace-grade aluminum honeycomb design spool gives you strength and light weight. Smooth, great drag system, you could put a lot of crappies in the bucket with this reel. 12+1BB super efficient sliding bearing. 1. 12+1BB super efficient sliding bearing. 2. Immersion in brake system with Japanese grease. 3. Precision turning brass rod. 4. Gapless one-way reaction system. 5. Aluminum Alloy bold throw line (ring spinning frame). 6. Aluminum alloy turning folding rocker arm. 7. Aluminum Alloy honeycomb hollow cup line.